We are SO excited to announce our newest exclusive member-only benefit program, Ashland ChamberCa$h. 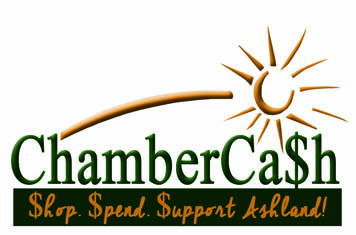 Ashland ChamberCa$h is a community currency program that is purchased from the Chamber website and can be used ONLY at participating member merchants. This provides you, our members, with a fantastic tool to grow your business! Our area’s employers spend approximately 2% of their payroll on gifts, sales incentives and employee recognition. That’s approximately $406,000 per year in the Ashland area! Our goal is to make Ashland ChamberCa$h a reward that our employers will use because it will benefit our members and the community! We also want to increase traffic to our local businesses in a way that is affordable and rewarding. Our business community is made up of businesses that offer special services and merchandise. From retail stores to professional, personal and business services, this program can boost your bottom line! A special thanks goes out to Bill Harris Dealerships for sponsoring this community minded program. READY TO SIGN UP AS A MERCHANT? CLICK HERE!